In case you didn’t know, the Emmys are this Sunday, and Jimmy Fallon is the host. 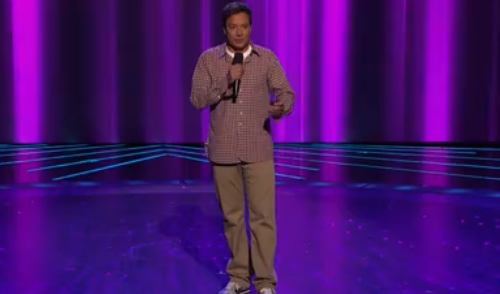 To promote said award show, Fallon went on America’s Got Talent. And he performed… not his own standup… but impressions of every standup under the sun. In order, Fallon channeled: Jerry Seinfeld, Bill Cosby, Chris Rock, Robin Williams, Norm MacDonald, Gilbert Gottfried, Pee-wee Herman, Jeff Foxworthy, Eddie Murphy, Larry the Cable Guy, Steven Wright and Adam Sandler. This is truly a tour de force performance, not just because the impressions are quality in terms of voice and mannerisms, but because Fallon did jokes in the style of each comedian that were spot on (for example, his Stephen Wright joke).